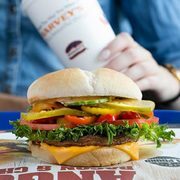 Harvey's Harvey's Coupon: FREE Regular Fountain Pop with Purchase of an Original Burger! FREE Fountain Pop with Original Burger Purchase! Free drinks are always the best drinks, so wash down your lunch with this new offer from Harvey's! As always, your coupon cannot be combined with any other offer or promotion. Cheese and bacon are available for an extra charge. This coupon is live through March 14 at participating locations only. No kidding Harveys. I used to get their weekly deal which was like a 5,99 regular hamburger, fries and drink or 6.99 chicken sandwich fries, drink -- a real deal. This is just a joke. I haven't been back since they stopped offering the other deal.